The Governor of Arunachal Pradesh, P.B. Acharya has condoled the sudden demise of Jomde Kena, Hon’ble Minister for Health and Family Welfare. Expressing shock and grief, he said that in his death, the State has truly lost a young and dynamic leader and a seasoned politician. In his letter to Smt Dajum Kena, wife of Late Jomde Kena, the Governor said Late Kena was eminent social worker and a public figure of eminence. Apart from his other valuable services to the State in his long political career, he will be remembered for his contributions as Health and Family Welfare Minister. In this hour of crisis, my wife Smt Kavita Acharya and I, join the people of Arunachal Pradesh to pray to the Almighty God ‘Donyi Polo; to give you and other members of the bereaved family enough strength and courage to bear the irreparable loss. I also pray for eternal peace of the departed soul, the Governor said. 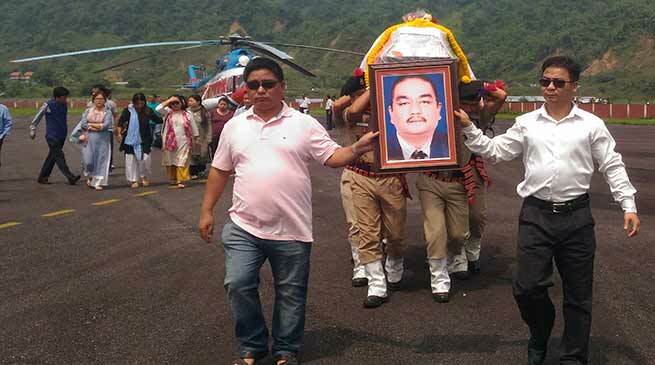 Secretary to Governor Vinod P Kavle and the Aide de camp (ADC) to Governor Dr. Irak Bagra laid the wreath on the mortal remain of Late Kena on behalf of the Governor, who left for Nagaland in the day.